William A. Erwin was born on his father’s plantation, Bellevue, a magnificent property situated on the banks of Upper Creek, which had been granted to his great grandfather, Alexander Erwin in 1780, Burke County, NC on July 15, 1856; he was the son of Col. Joseph J. and Elvira J. (Holt) Erwin. After finishing Finley High School in Lenoir, he enrolled at what was known as the A&M College of Kentucky for two years. In 1874, he became a salesman in the general store of Holt, Gant & Holt at Burlington, NC until 1877. That store was a part of the empire of his uncle, E. M. Holt. He left to become a bookkeeper with the North Carolina Railroad Company in Burlington. In 1878 he became a merchant himself and continued until 1882. 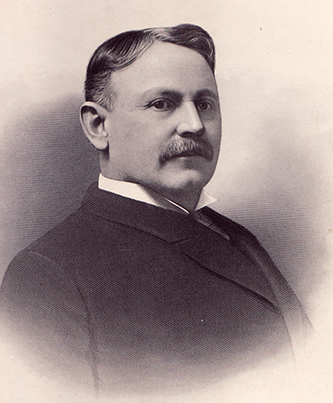 In 1882, he rejoined the Holt businesses and served as Treasurer and General Manager of the E.M. Holt Plaid Mills, Alamance County, and served in that capacity for 10 years. George Watts and Ben Duke recruited William A. Erwin to be the manager to their new textile enterprise in West Durham, purportedly on the recommendation of Southgate Jones. Erwin was 36 years old when he came to Durham, and confidently told Ben Duke that he could derive 40% net profit from the business they were to establish. Erwin invested $40,000 in the venture, while Ben Duke and George Watts invested $85,000. Purportedly, after some discussion of what to name the new venture, BN Duke remarked "Let us name it for this young man; then if it fails the onus will be upon him; and if it succeeds, it will be to his glory." This business grew to become one of the largest in the state. Erwin Cotton Mills Company, Numbers 1 and 4 at West Durham with 75,000 spindles, 903 narrow looms and 1,030 broad looms; Mill No. 2 at Duke (now know as Erwin, NC), with 35,000 spindles and 1,024 looms; Mill No. 3 at Cooleemee, with 48,000 spindles and 1,296 looms. Also under his management were the Durham Cotton Manufacturing Company in East Durham with 24,000 spindles and 820 looms; the Pearl Cotton Mills, North Durham, with 11,000 spindles and 248 broad looms; Oxford Cotton Mills at Oxford, NC, with 6,2000 spindles; and the Locke Cotton Mills at Concord, NC, with 35,000 spindles and 976 looms.